Name one news involving Rajnikanth that doesn’t spread like a wild-fire; I bet you’d not find any. The stalwart of Indian cinema, Rajnikanth is back in the news again. This time, however, there are no new trend of memes, nor has his movie raked in a 6-digit collection in the first two days. It’s just that the phenomenon himself has just joined TWITTER!!! 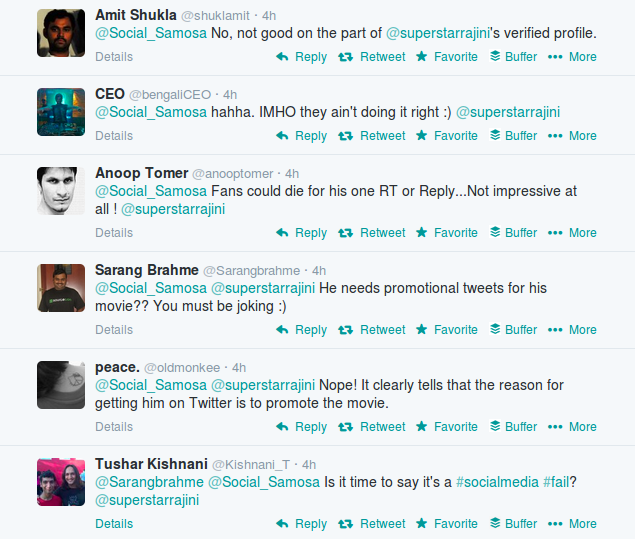 Yes, Rajnikanth made his Twitter debut today to the surprise of everyone. For all those who were excited to post their tweet on the legend’s timeline and expected a reply or a re-tweet as celebrities normally do, to say the least, it turned out to be a big disappointment. Thousands of patrons were treated to an automated reply that was too robotic. The autographed poster,which is a part of a broader digital marketing strategy, could have been sent out on a later stage. The hype and excitement surrounding Rajni’s social availability could have been dealt in a way more matured and interactive than this. CA Media Digital’s first venture, Fluence, the agency handling the legend’s presence on the social circuit seems to have missed out a trick or two. It’s not a common occurrence to represent a figure as towering and influential as him on the social media platform; and if you’re handling brand Rajinikanth, you need to be extra careful. Quite a few technical glitches found their way in the first couple of hours on his account. In a digital age where products of daily use and commercial brands indulge in a cut-throat competition, a living legend can be portrayed in a much desirable and convincing manner. Also, for a person who has an astronomical saleable value, it is amateurish to represent him in a very spammy manner. With the digital space exploding with innumerable opportunities to market a brand, it seems that the agency has messed up big time. And people we clearly not happy with it. Now that the twitter handle is alive and kicking, I’d expect it to be more fan-centric with conversations and messages being appreciated from time to time. Regular updates and posts from his personal as well as professional life would be something that his ever-increasing fan base would like a sneak peek into.